Unless you have serious political campaign fatigue and have blocked out every media message, it’s likely you’ve been exposed to the sweeping changes that digital innovation and technology are bringing to the business world. In fact, a few pundits have noted that the expectation for digital innovation and technology may surpass the business impact of the Internet. Connecting to their customers in a meaningful way—For example, an Australian customer we worked with saw the impact of moving from a manual paper-based sales order system to a digital-based system that is fast and accurate. And, it saw a typical 2-week contract renewal cycle reduced to just 1 hour. The Infor Digital Engineering team provided a way to evaluate existing processes, and propose the optimal mix of software solutions to help make this change happen. Improving employee engagement—With today’s multi-generational workforce and the ease of technologies like smartphones, iPads, apps, streaming, and such, many workers expect the work systems they use to operate much the same as those in their personal life. Working with several retail customers on work scheduling, we found it was typically incumbent on employees to go to the store to get their schedule. By examining the process, Infor digital engineers were able to understand the current operations, and integrate a digital system whereby employees are notified via text, email, or even their wearable technology about their work schedule. Creating greater operating efficiencies—That’s expected if you improve the connection to your customers and employees. But there is more opportunity here in the realm of data analytics. When it comes to digital innovation, this area is very important. Analytics used to mean a view of what was done yesterday, last week, or last month. But now, we can look forward with predictive and prescriptive analytic capabilities. The Infor Digital Engineering team has just launched a new project, called Reveal, with manufacturing and healthcare companies. And, we’re looking for volunteers who are interested in building world-class predictive and prescriptive analytic capabilities with us. If that’s you, contact the Infor Digital Engineering team. There is solid research available discussing the impact of digital on growth. 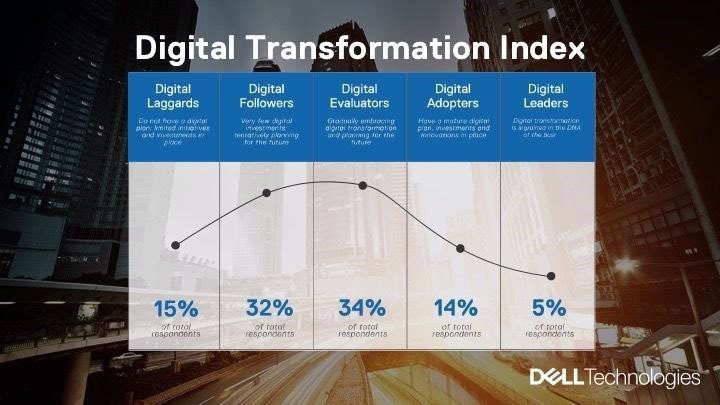 This slide from Dell Technologies shows 34% of businesses are evaluating what to do, and only 15% of companies are doing nothing. Don’t let that be you. The Infor Digital Engineering team is here to help you. Call us at any stage. We can help you with ideation, and help you create a custom digital strategy. We’ll help you figure out what you can do, what a prioritized plan could look like, how you can benchmark progress, and how to do it all using Infor’s deep industry expertise. We understand what matters to specific industries—like yours. Learn more about Infor's digital engineering approach.